This was certainly true for a father dining with his children at a McDonald's in Birmingham, Alabama, who fatally shot a masked man who entered the fast food restaurant and opened fire. The events took place on Sunday evening at around 10:45 p.m. Just as an employee opened the door to let a father and his two sons out of the restaurant, a masked man entered. The criminal immediately started shooting up the place and the father didn’t hesitate one bit. He pulled out his own piece and opened fire on the gunman, fatally wounding him. The unidentified dad and one of his kids, a minor, were also struck in return, but first responders confirmed that neither of them has life-threatening injuries. Birmingham police spokesman Sergeant Bryan Shelton confirmed that the police investigation is still ongoing, but based on the preliminary information, the father won't face any charges. Mr. Washington admitted he was very thankful the armed customer was there. Does anyone know how to write anymore? What?!? No steers to bang so you post here? This man is obviously a brave American Patriot & Hero! Again without that brave man who put himself & his kids in mortal danger to save others. Truly a selfless act. Even I would have taken time to let my kids take cover, before engaging. Which surely would have lead to injury & death to the patrons. 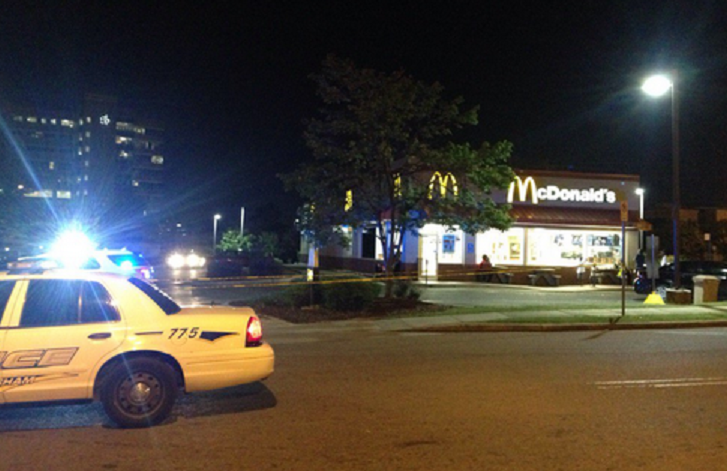 Antonio Demond Sanders, 24, (Black-American) was killed when he opened fire in a McDonald's restaurant in Birmingham. NOTE: He had only recently completed "The Dannon Project". This is a program aimed at reducing the tendency of a convicted criminals to re-offend. (YEP! that sure didn't worked ☻) . Court records show Sanders pleaded guilty in July to possession of illegal drugs and carrying a concealed pistol without a permit (Felony). He entered the plea after taking part in the program, got out quick and was back at it . YEP!, he WAS a convicted criminal, now a DEAD Felon. An despite all those Gun Control Laws that make it harder for CITIZENS to quickly acquire a means of Self-Protection, a Convicted Drug using Felon had a firearm. Instead background searching CITIZENS, why not require all Convicted Felons be issued SPECIAL State ID's stamped prohibiting firearm purchases? Then make it a law requiring a 10 year min sentence for FELONS caught with Firearms.